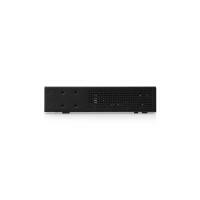 enterprise-level features in a compact and affordable unit. The EdgeRouter 4 and EdgeRouter 6P are each capable of routing up to 3.4 million packets per second. 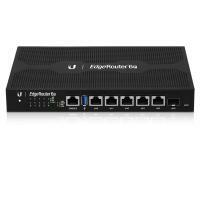 The EdgeRouter 4 has a line rate of 4 Gbps, while the EdgeRouter 6P has a line rate of 6 Gbps. your network. For advanced network professionals, an integrated CLI is available for quick and direct access using familiar commands. Even greater convenience and flexibility is provided by the UNMS app, which makes it possible to manage the EdgeRouter remotely from your mobile device. addressing for your network devices. Monitoring Tools Conveniently track network activity and devices from tools such as Ping, Trace, Discover, Packet Capture, and Log Monitor. Firewall Policies Organize the rules you apply in the order you specify. 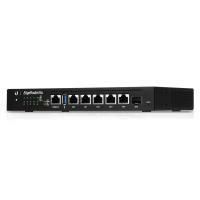 Firewall Groups Apply the policies to groups filtered by IP address, network address, or port number. NAT Rules The EdgeRouter changes packet addressing based on your customized source and destination NAT rules. Interfaces Each port functions as an independent interface. You can also configure Virtual Local Area Network (VLAN) interfaces for network segmentation. Routing Configure static routes and dynamic routing protocols to effectively manage the routes used by the EdgeRouter. The EdgeRouter™ 6P offers next-generation price/performance value: up to 3.4 million packets per second processing with a line rate of up to 6 Gbps. 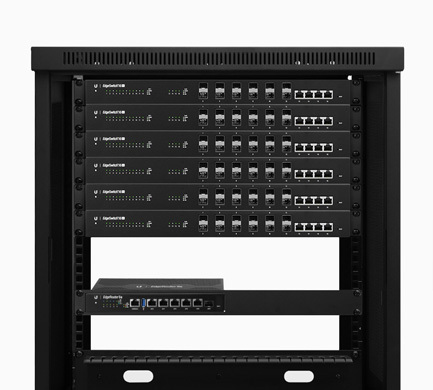 The EdgeRouter 6P can be rack-mounted with the use of the EdgeRouter Rack Mount Kit, model ER-RMKIT (sold separately). The EdgeRouter 6P is supported and managed by UNMS™ (Ubiquiti® Network Management System), a comprehensive controller with an intuitive UI. A single control plane manages registered EdgeMAX® devices across multiple sites.